Aerial view of Chew Green Roman camps. Photo © Tim Gates. 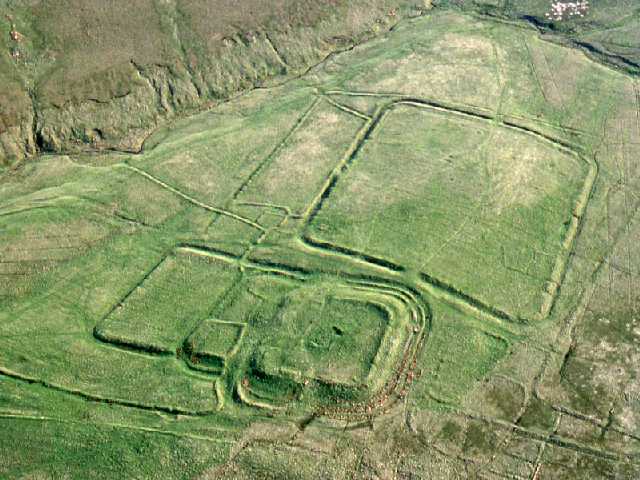 There is a complex of Roman military camps at this remote location. A Roman fort, two fortlets, two camps and a section of Roman road can be seen here. Over these remains lie traces of medieval settlement with a small chapel. The southern camp is the largest feature at Chew Green. 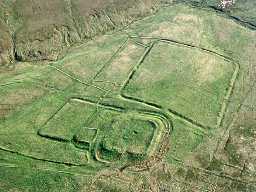 It is roughly square in shape and encloses an area of over 7ha within a rampart and a surrounding ditch. In places the line of the defences is obscured by later parts of the monument. There is a gate in three of the sides. Archaeological excavation in 1937 uncovered what may have been the ditch of a Roman fortlet, which was subsequently constructed over the south-eastern quarter of the camp. There are no surface remains of this feature which was probably demolished to built a second fortlet. A second temporary camp lies immediately north of the first and partly overlies it. It survives partly as an upstanding earthwork and partly as a buried feature. Again, at least three gateways are visible. Within the remains of the earlier temporary camp there are the well-preserved remains of a Roman fort. Visible remains inside the fort suggest that it was used on a nearly permanent basis; parts of road can be seen and traces of a number of pits, which are thought to be the remains of building foundations. To the east of this fort are the prominent remains of a strongly defended fortlet. It is roughly square in shape and is defended by at least three ramparts. These monuments lie immediately adjacent to the Roman road known as Dere Street constructed during the first century AD by the first Roman governor of Britain, Julius Agricola. It can still be seen as an occasionally visible mound. The Chew Green monuments are a Scheduled Monument protected by law.